How to find the front-to-back ratio given an antenna radiation pattern diagram? 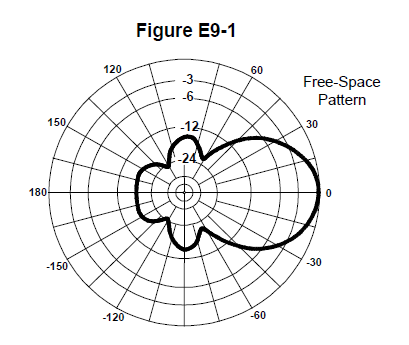 I know that the front-to-back ratio is 18dB in the below antenna radiation pattern diagram, but I don't know how to read the diagram to obtain this result. How does one read and understand such diagrams? The diagram is a polar plot where 0 degrees (the 0 on the right-hand edge) corresponds to the front of the antenna and 180 degrees corresponds to the back. Within the diagram, a logarithmic scale is utilized to represent radiation strength. This is in addition to the fact that the Decibel is a logarithmic unit. (The diagram really should explicitly list its units, but for the application of antenna radition, the unit is typically dB.) You can tell that a logarithmic scale is in use by observing that the distance between the $-6$ and $-12$ lines is the same as that between the $-12$ and $-24$ lines, so it's obviously not a linear scaling. For the front-back ratio, we look at the values indicated on the plot for 0 and 180 degrees. In this particular instance, the value at 0 degrees is $0$, and the value at 180 degrees is approximately $-18$. Since logarithmic scales transform division into subtraction, we calculate the ratio front to back by subtracting the logarithmic back value from that of the front. Since $0 - (-18) = 18$, the answer is 18dB. Not the answer you're looking for? Browse other questions tagged antenna math or ask your own question. How does a “chip antenna” work? How does a slot antenna work? Can you place reflective material near to an antenna without interfering with the radiation pattern? Would a covering like aluminised kapton effect antenna radiation pattern? How do I specify that wires are connected in 4NEC2? What happens to the transmitted power cancelled out by a yagi antenna's reflector? What is the radiation pattern of an EH antenna?